A section of the Quiet Man Greenway. CIE has confirmed that the development of the Quiet Man Greenway along the Tuam to Athenry railway line will not prevent it from opening the rail line again for train use, if such services were ever reintroduced. With county councillors set to vote next week on the development of a feasibility study into such a greenway, the company has stated that fears over the loss of a future rail service in the event of a greenway development are unfounded. In a letter sent by Niall Grogan, CIE’s National Estate Manager to Minister Ciaran Cannon, a keen advocate of the greenway the company said that CIE has this arrangement in place with other railway line properties which are used as greenways. 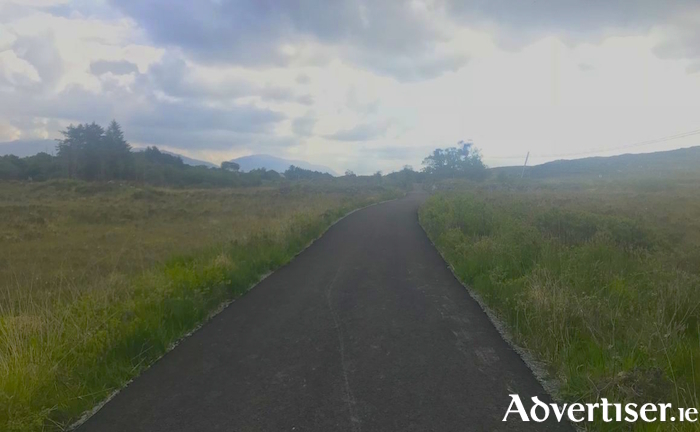 “Such a clause has already been used in the licences issued for the Waterford and Westmeath greenways and there is no reason why that would not happen in the instance of the proposed Quiet Man Greenway. “Thus, if it ever transpires that our local rail line is needed for new rail services, CIE has the power to immediately revoke a licence for a greenway,” he confirmed. He said the call has now been issued by Ministers Ross and Griffin for applications for the National and Regional Greenways Funding totalling €53m and this means that the race is now on for each interested community’. The announcement that applications are now open for the National and Regional Greenways Funding Call was also welcomed by Seán Canney TD. “€53 million is available for greenway projects over the years 2019 to 2021. In advance of the formation of the current government, I lobbied hard for the inclusion of significant funding for greenways and this funding was committed to in the Programme for a Partnership Government. “Greenways offer a unique way to allow tourists to explore rural Ireland, to get away from an experience of Ireland that is centred on cities and enjoy the natural landscape. This current round of funding is seeking to develop greenways of scale that are appropriately segregated from traffic, and provide access to beautiful scenery,” he said.